Occasionally, I end up in the news or mentioned on a web site. Here’s what they had to say! Nineteenth century poet and preacher Edwin Hubbell Chapin once said no language can express the power and beauty of a mother’s love. 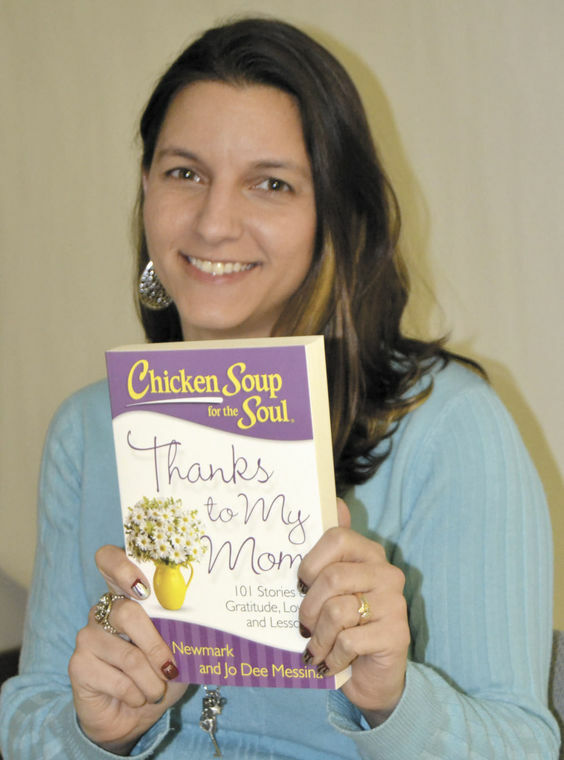 However, it seems that North Penn alumna Denise Drespling, class of 1999, now of Lawrence County, has eloquently challenged that statement by expressing the power and beauty of her mother’s love in the short story “The Sun, the Moon, and the Stars,” which is featured in the newest installment of the famous Chicken Soup books “Chicken Soup for the Soul: Thanks to My Mom,” which was released March 17. The 34-year-old’s story appears in the section titled “The Best Cheerleaders,” a collection of stories that highlights moms that championed their children. Drespling’s mom, Pat Shari, of Lower Gwynedd, was one of those parents. “The Sun, the Moon and the Stars,” chronicles a time in Drespling’s life when she was battling depression, which was in part due to teenage angst, as well as grappling with her parents’ separation and eventual divorce, she said. Her depression morphed into addiction, and for six months after her 18th birthday she found herself in a rehab facility, two hours from home, working to reclaim a life that had been governed by heroin and cocaine, she recounts in the story. Watching her daughter battle addiction wasn’t easy, Shari said. She was devastated when she learned about her daughter’s drug use, and as a single mother, didn’t know exactly what to do, she said. What seemed to help Drespling the most were cards of encouragement, all of which had a variation of sun, moon and star images on the cover. In the story, Drespling mentions three special cards she kept and the moment her mother gave them to her. One particular card was “blue with gold stars and a colorful image of a sun reaching out its rays to a smiling moon,” Drespling describes in the story. This was the card her mother gave her when she celebrated her first drug-free year, which she said seemed to represent that year perfectly. “We’d come through it, and we were still shining,” she wrote. Through the sun, moon and star cards, Shari said she also wanted her daughter to see that there was no boundary or limit to what Drespling could do. Now a wife and a mother, Drespling has an associate’s in information technology and programming from the University of Phoenix, a bachelor’s in Christian Life and Ministry from Lancaster Bible College and will complete a master’s in creative writing from Carlow University in April, she said. She also had several works published in a variety of literary publications. Shari said she is very proud of what her daughter has accomplished. To learn more about Denise Drespling visit www.denisedrespling.com and for more on “Chicken Soup for the Soul: Thanks to My Mom” visit www.chickensoup.com. 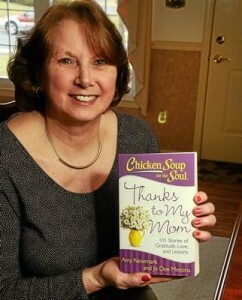 Denise Drespling proudly holds the latest edition of the ‘Chicken Soup for the Soul’ series which includes her tribute to her mother. Denise Drespling is a woman who is going places. She will complete her master of fine arts degree in creative writing at Carlow University next month. She has published five short stories, established an online blog and set up a YouTube channel. She has also authored five novels, which are in various stages of editing and founded a monthly literary critique group. But her life was not always such a success story. She fell into depression at age 15 and later became addicted to heroin and cocaine. If it had not been for the encouragement of her mother, she believes she might have never overcome her troubles. 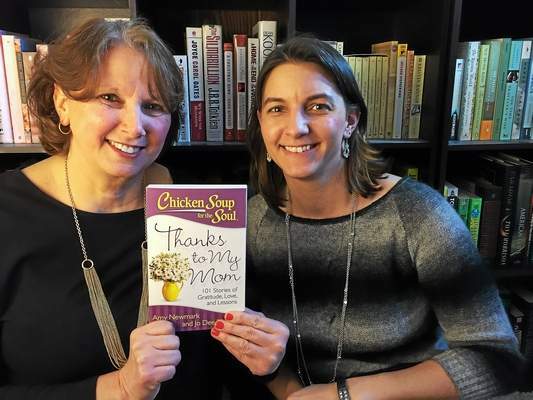 Drespling will have her tribute to her mother published in “Chicken Soup for the Soul: Thanks to My Mom.” It is Drespling’s first non-fiction publication. Drespling’s essay, titled “The Sun, The Moon, and the Stars,” refers to the picture on a card her mother gave her when she celebrated one year drug free. She describes how her mother’s unfailing support and encouragement helped lift her from the dark days of addiction and rehab. Now 34 and a mother herself, Drespling recalls a letter her mother wrote to her when she was a teenager coping with depression. It so impacted her that she saved it to take out and re-read when she was at her lowest. “I’m sure at the time my mother had no idea how important a few sheets of notepad paper filled with encouraging words would be to me,” she recalls in her essay. But they were critical in giving her hope to go on. Through the years, her mother also gave her several cards, all of them carefully chosen for the pictures on the outside and containing encouraging notes inside. She added the cards to the letter and took them out to read over and over again on her journey to health. Drespling also earned an associate’s degree in information technology/programming from the University of Phoenix and a bachelor’s degree in Christian Life and Ministry from Lancaster Bible College. She does freelance website design and is seeking an agent to market her novels to the literary world. She founded “Literary Fusion,” a writer’s critique group which meets monthly in Wexford. Drespling also blogs at “The Land of What Ifs” at www.denisedrespling.com. Her YouTube booktube channel can be accessed by searching on Denise’s name or at YouTube.com/user/denisedrespling. She is also active in her church, Victory Family Church in Cranberry. A quick, witty BookTuber, Denise films book reviews, prompts conversation and discusses common bookish problems. See her latest video, and our current favorite, “Should You Date a Non-Reader?” We love Drespling for the variety her channel provides and of course, the laughs. I did want to to pick one shining star who stepped up and took control of some of the more difficult tasks that happened over the last 10 months, especially when it came to our anthologies. 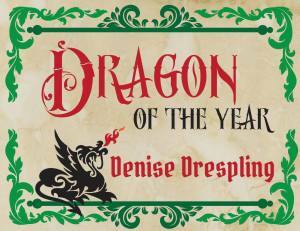 That someone is Denise Drespling, who I would like to name our 2014 Dragon of the Year! Denise, thank you for all the hard work and dedication to this group. Your enthusiasm keeps other people cheerful, and it wouldn’t be the same without you.